We’re into the third week of the summer holidays here and it’s so nice to be able to spend some quality time with the girls. They’ve enjoyed having some downtime too after a busy year at school. I can’t quite believe that Phoebe is moving into Year 1 and Eleanor into Year 3 in September. Like many parents, I keep on wondering where the time has gone. It really doesn’t seem so long ago that they were tiny babies and now they’re both so fiercely independent. As is usually the way over school holidays, we haven’t really got much planned. 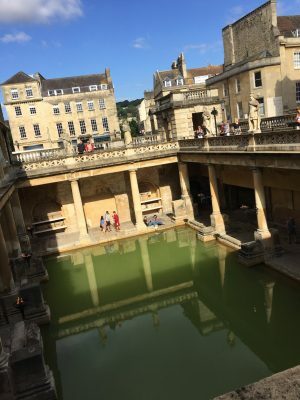 We tend to do a couple of impromptu days out instead, so last week saw us piling into the car and heading to Bath. I’ve never been there before and it’s always lovely to explore new places as a family. 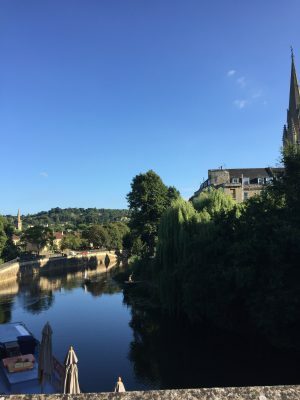 Bath is a beautifully historic place and there was far more to explore than we could manage in a day. The Roman Baths were fascinating and both girls really enjoyed it. While we were there Eleanor said that she was really interested in history and can’t wait to learn about the Romans. I’ll admit to having a sense of pride; she’s such a mini-me. Another thing Eleanor has decided she wants to do over the summer is sew a skirt for herself and add some content to her website. Probably a little over a year ago she decided she wanted to make a stop frame film (as you do) so we set up a website for her to be able to show her teacher. Now she wants to write some stories to put on there. I think it’ll only be a matter of time before Phoebe wants to get in on the act. This summer has also been about trying to fit in some work around the girls, which is a new one for me. It does mean that they’ve got a few days of tennis and karate to enjoy whilst we get as much done as we can! Today is one of those days, but I’m taking a bit of time out to tidy up some blog stuff. Shhh….! I really thought that by now I’d be making some serious progress on my 2018 Make Nine choices. Best laid plans and all that… I’m halfway through at least two sewing projects at the moment but I’m really struggling to find the motivation to actually finish them. I think my motivation has melted in the heat. Wedding dress motivation has certainly dissipated; after my win of the bodice muslin I’ve put it away again. It feels too early to be even be making my wearable muslin to be honest. My deadline for that is November so I’m going to look at it once the girls are back at school. Although we’re very excited to be getting married, now the majority of the organising has been done our enthusiasm has waned somewhat. As I keep on telling people, we’re in the boring earn-money-to-pay-for-it-all phase. 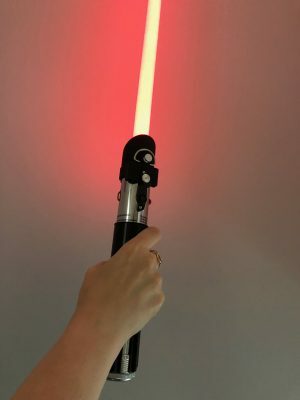 The most exciting wedding thing to happen recently (or just thing in general) is that Andy has bought me a Darth Vader lightsaber for the ceremony. I cannot convey my enthusiasm enough but my face in this photo is about right! I realise that Star Wars really isn’t everyone’s cup of tea but I am more than happy to be going full on geek with this. 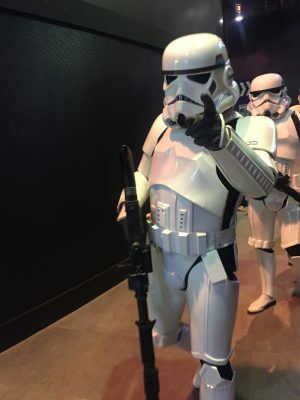 Speaking of, since we saw the UK Garrison at The Space Centre, I’ve decided that after the wedding I really want to make my own Stormtrooper outfit and join them! It’s a bit random I guess, and my friends probably think I’ve lost my mind, but it would be so much fun. My Dad approves at least and it made him laugh.